Mr R turned three today and has continued his love for all things on wheels. He’s already skilled at distinguishing the siren of an ambulance from that of a fire engine or police car and has asked me several times how long it will be until he can drive the car. He’s not too impressed with my answer -15 years. 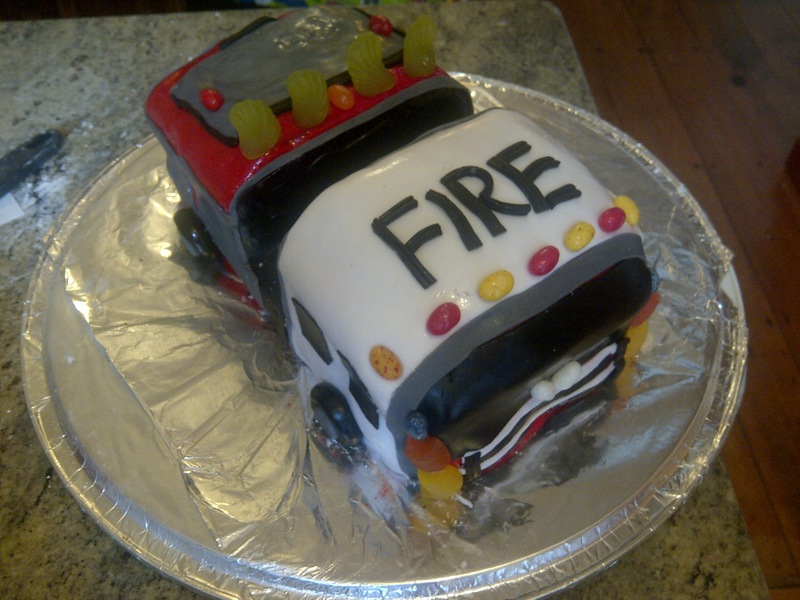 And so it was decided that he would have a fire engine cake. As usual, I spent a lot of time “researching”, also known as wasting time on the Internet. There are some really fantastic cakes out there and some very creative mums. Mine was not a thing of great beauty, or a particularly accurate of a fire engine, but it ticked the necessary boxes – it was recognizable and it was packed with sugar. The end result was one happy three year old! I don’t have an action shot partly because it’s about 150% humidity in Sydney at the moment and the cake suffered a bit, but largely because we all got carried away during the singing, cutting and eating but. Which is of course exactly as it should be. The next birthday project is Miss B’s 5th birthday in March. She wants an Angelina Ballerina cake. Bit daunted by that one! I think it looks FABULOUS! You’re making me nervous about Ali’s future birthdays! Great job the heat and humidity is terrible but it did give the engine a nice shiny look – a fire engines are suppose to dazzle with shine. It looks amazing, and Happy belated Birthday to Mr R 🙂 I can’t wait to see how you tackle the Ballerina cake.